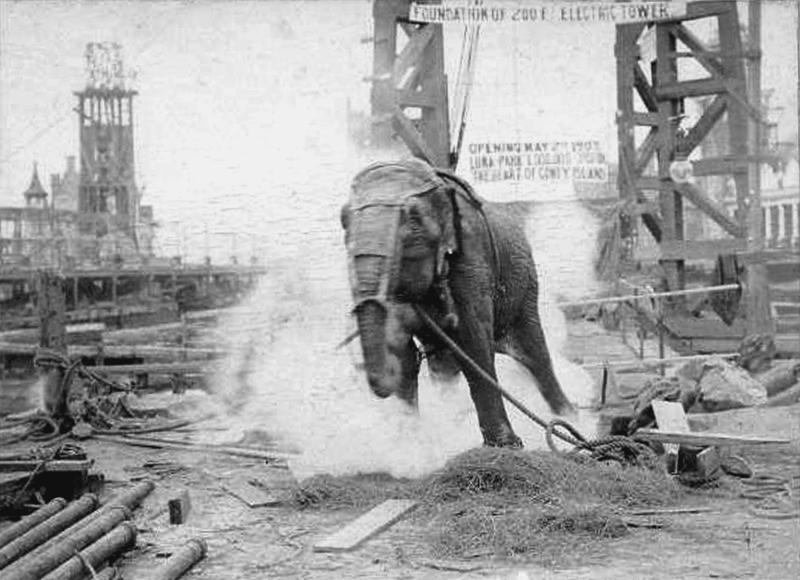 Topsy (circa 1875 – January 4, 1903) was a female Asian elephant put to death at a Coney Island, New York amusement park by electrocution in January 1903. Born in Southeast Asia around 1875, Topsy was secretly brought into the United States soon thereafter and added to the herd of performing elephants at the Forepaugh Circus, who fraudulently advertised her as the first elephant born in America. During her 25 years at Forepaugh, Topsy gained a reputation as a "bad" elephant and, after killing a spectator in 1902, was sold to Coney Island's Sea Lion Park. When Sea Lion was leased out at the end of the 1902 season and redeveloped into Luna Park Topsy was involved in several well-publicized incidents, attributed to the actions of either her drunken handler or the park's new publicity-hungry owners, Frederick Thompson and Elmer Dundy. Their end-of-the-year plans to hang Topsy at the park in a public spectacle and charge admission were stopped by the American Society for the Prevention of Cruelty to Animals. The event was cut back to invited guests and press only and Thompson and Dundy agreed to use a more sure method of strangling the elephant with large ropes tied to a steam-powered winch with poison and electrocution planned for good measure. On January 4, 1903 in front of a small crowd of invited reporters and guests Topsy was fed poison, electrocuted, and strangled, the electrocution ultimately killing her. Amongst the press that day was a crew from the Edison Manufacturing movie company who filmed the event. Their film of the electrocution part was released to be viewed in coin-operated kinetoscopes under the title Electrocuting an Elephant. The story of Topsy fell into obscurity for the next 70 years but has become more prominent in popular culture, partly due to the fact that the film of the event still exists. In popular culture Thompson and Dundy's killing of Topsy has switched attribution, with claims it was an anti-alternating current demonstration organized by Thomas A. Edison during the War of Currents. Historians point out that Edison was never at Luna Park and the electrocution of Topsy took place 10 years after the War of Currents.